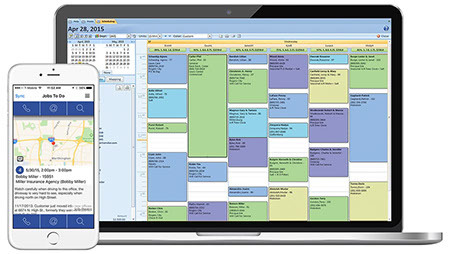 Window cleaning scheduling software makes scheduling and communicating with your window cleaning crews more efficient. Want to easily manage your customers at the same time? Say hello to Smart Service, the window cleaning scheduling software for QuickBooks. If you need a better way to schedule work and dispatch it to your team, you need Smart Service. The Smart Service system includes a mobile window cleaning app, making it incredibly easy for your office and field teams to work together and pass info back and forth. This window cleaning software for QuickBooks partners with the Intuit accounting program to make life (and work) much, much easier. Do you want to take your company to the next level? QuickBooks makes accounting much easier for small and mid-size businesses, but it can’t do everything. If you’ve gotten tired of managing financials in QuickBooks only to switch to another system when it comes time to schedule a job, you need to get your hands on the window cleaning software Smart Service. This program eliminates the need for double data entry and duplicate records. Smart Service gives you the tools to view and manage all the information associated with a customer in a single location. If you need to make a change to a record or send an updated work order to one of your field teams, no problem! A few clicks of the mouse and you’re off! Once you start with this window cleaning software for QuickBooks you’ll never look back. Hook up Smart Service to QuickBooks, and you’ll instantly get a chance to import your existing customers. Create and schedule a new work order, and Smart Service will pull the relevant contact data from your QuickBooks records. Add any job notes you want, then send the work order to your field team via the Smart Service mobile app. Once your crew arrives at the customer’s location, they’ll update the work order as they complete the job. If they need to collect a customer signature, they can do so within the app before sending the completed work back to the office for approval. Once the bill goes out and the payment comes in, Smart Service automatically updates the customer’s record in QuickBooks. Everything stays in the same system! The window cleaning business is all about recurring customers. In this field, you have your regular routes and regular customers, and you need a good way to manage each. Smart Service window cleaning software for QuickBooks provides exactly that. In addition, Smart Service lets you collect payment and bill your way. Do you send out invoices after each job? Or do you wait and do batch invoices? Either way, Smart Service has you covered. Need to reference an old form, photo, or customer record? Again, Smart Service has your back. This tool gives you the ability to make all your window cleaning business dreams come true. Smart Service window cleaning software offers so much to your business, we can’t even begin to fit all the features onto a single list. We can make a decent start, though! See Smart Service get things done! Request a free demo of our window cleaning software for QuickBooks posthaste! Clean out the window cleaning competition with this advice!